When does offsides start? Do we have a goalie this year? How long is the game? Get quick answers to your questions with this handy cheat sheet for coaches detailing the rules for each age group. Download this Word doc to see an example email to send to your soccer parents. A great way to introduce yourself to your new team and it hits all the key points so you don’t forget anything. Just fill in the names and dates and you’re good to go. 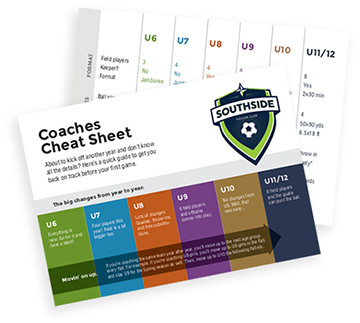 Download the Whatcom County Youth Soccer Association Handbook for all the official rules. Whether you’ve been doing it for years or just getting started, we could all use more tips, drills and ideas for successful practices. 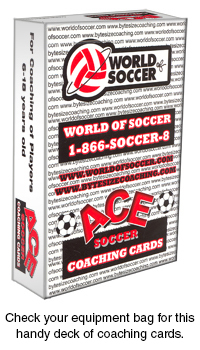 Also, every Southside coach should have a set of Ace Soccer Coaching Cards in their equipment bag. Look through these cards for ideas and bring them to practice for quick reference. Interested in becoming a coach? We’d love the help. Every season we have lots of kids that want to play so coaches are in high demand. If you haven’t coached before or don’t really know much about soccer, no worries. We provide access to training sessions and coaching experts that can come lead your practice for a day to give you tips. You can register to be a coach through the Whatcom County Youth Soccer Association. Coaches, don’t forget to complete your background check. They need to be re-submitted every year. Thank you!